An Age of Uncertainty is Here! Turmoil has spread throughout the Cosmos, and a new group of aliens hope to take advantage of it. How will these hopeful rulers attempt to seize power? Only time will tell. 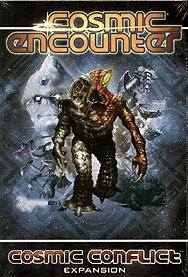 In Cosmic Conflict, 20 new alien races explode onto the galaxy! Players will now shudder at the insidious kindness of the Empath, blink in confusion at the antics of the Lunatic, and howl in outrage as their planets are stolen away by the Claw! Cosmic Conflict also makes the Cosmos even bigger, adding another player to the game. Finally, as if that wasn't enough, Cosmic Conflict introduces a new variant to the game - the hazard deck, which confronts the players with dangerous and amusing events that can crop up at any time. Requires Cosmic Encounter to play.